For the perfect Glamping Holiday at Tom’s Eco Lodge why not add one of our special Gift Packages or Extras to your booking? If you are staying for a special occasion or celebration, or just want to treat yourself to a break away from it all, select your extras, and it will all be ready for you when you arrive. We aren’t just limited to the options below either… if you have any special requests let us know and we will see if we can arrange it for you – almost anything is possible! 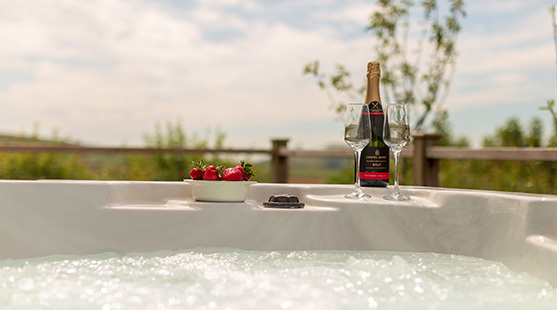 Once you have made your holiday booking online email stay@tapnellfarm.com, or give us a call on 01983 758729 with your Gift Package/Extras requests – we are happy to help you with anything we can do to make your stay even more special. An amazing opportunity to start the day with a one hour bespoke yoga session followed by delicious brunch – so if you are holidaying with us with friends or family, or enjoying a group booking for a Hen weekend or other, you might like to add this healthy start to your holiday. Bespoke Yoga sessions also available for individuals or groups of up to 4 – from £60. Isle of Wight bread, Country Butter, Local Bakery Pastries, Bonne Maman Jam & Marmalade, Cow Co Ground Coffee & Orange Juice. Tea, Sugar, buscuits & milk included. Indulge in a bottle of Prosecco Frizzante and chocolates. Local Butchers Sausages, Bacon, Isle of Wight Tomatoes & mushrooms, Brownrigg Eggs, Isle of Wight bread, Country Butter, IOW Tomato Stall Ketchup & Orange Juice. 2 person pack £20. 4 person pack £25. 6 person pack £30. 8 person pack £40. Tea, coffee, sugar, buscuits, & milk included. Local Butchers Sausages & Beef Burgers, Marinated Chicken Kebabs, Local Bakery Buns, Mixed Salad, Pasta or Potato Salad, IOW Tomato Stall Ketchup & Sparkling Elderflower. 2 person pack £25. 4 person pack £30. 6 person pack £40. 8 person pack £50. Surprise your loved ones with a bottle of house wine and chocolates.